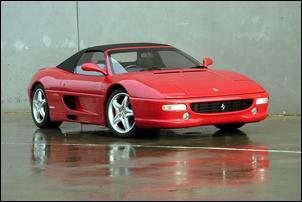 A Ferrari F355 Spyder that runs easy 10 second quarters thanks to a custom twin-turbo set-up! Ferraris have a reputation for speed. Pure, simple speed. But when Tony X pulls alongside you’d better be prepared to witness something totally dumbfounding. The speed of this prancing horse will challenge your grasp of physics! You’re looking at a regularly street driven Ferrari that punches out 450kW at the back wheels and can howl down the quarter mile in 10.9 seconds - on street tyres! Tony is no stranger to performance. He’s owned a Ferrari 348 Spider, various Porsches (including a low 11 second 944 Turbo) and he also owns a drag racer - a Camaro Top Door Slammer. 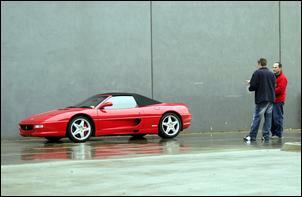 His F355 Spider was purchased brand new back in 1996 and was the second to arrive in the country (it was originally flown in for the 1996 Brisbane Motor Show). 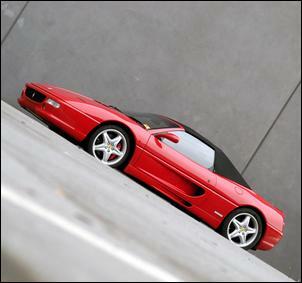 The F355 is powered by a 283kW (380hp) 3.5 litre V8 running 5-valve-per-cylinder heads, individual throttle bodies and lightweight titanium rods. It’s also one of the first models to bring full under-car aerodynamics into production. 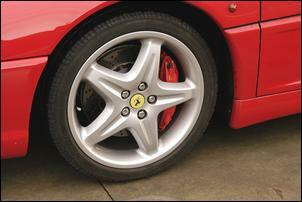 Tony says the F355 was a great machine back in the late ‘90s but he soon grew blasé about its standard performance. This was made worse by the fact that emerging performance cars (such as HSV LS1s) were offering performance scarily close to the mighty Ferrari. Time to fix that situation! Tony says he investigated turbo and supercharger kits from all over the world but the high cost - and the fact that the car would need to be shipped overseas - were major turn-offs. 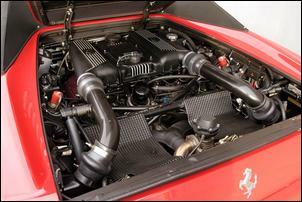 It was local tuning workshop – Nizpro - that got the job of breathing boost into the Italian Stallion. 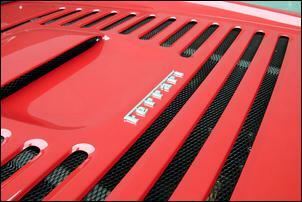 Turbocharging a Ferrari was a project that Simon of Nizpro grabbed with both hands. We’re told that the conversion was pretty straight-forward - the only out-of-the-ordinary step was the requirement to fabricate a custom muffler to suit the available space. The 11.5:1 compression ratio engine was to remain intact which means mild boost pressure and careful engine mapping were essential. 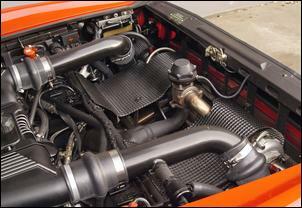 Simon used a pair of modified HKS 25/30 turbochargers that are mounted on custom manifolds. He chose to mount the turbochargers at the rear of the engine compartment about one metre away from the exhaust ports. This seems less than ideal from a turbo lag point of view but we’re assured the engine is very responsive. The exhaust manifolds use 1 ½ inch primaries leading into 1 3/4 inch pipes to the turbos. A single Turbosmart 48mm external wastegate is also integrated into the new manifold arrangement. 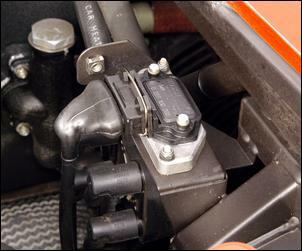 An oil feed for the turbos was inserted into a distribution block that branches out to the factory oil cooler. Due to limited space beneath the turbos, Nizpro fabricated a custom muffler which comprises inlets in the centre topside of the muffler body and outlets at each end on the bottom. It’s a straight-through design to give maximum gas flow. 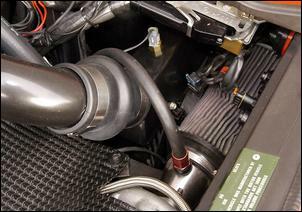 Induction air is filtered by a pair of K&N filters mounted on the turbo compressor mouths while boosted air is flung through a pair of custom side-mount intercoolers. These intercoolers are fed cooling air from the F355’s side intakes while electric fans draw air through the cores to maintain cool charge-temps in traffic. Twin Bosch blow-off valves (ex Ford XR6 Turbo) route air back to the compressor inlets on gear changes. With boost pressure set to 14 psi and tuned to run pump 98 RON fuel, the F355 TT has spat out 450kW at the wheels on Nizpro’s DynoLog chassis dyno. 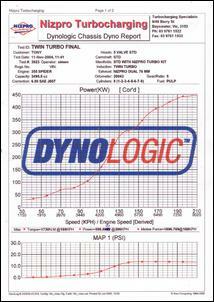 The top section of this dyno printout shows the power curve while the lower section shows the boost curve. As you can see, full boost is achieve at just over 5000 rpm and holds steady to beyond 8000 rpm. With the rev limit set to 9500 rpm there’s a healthy 4500 rpm operating range under full boost. Grip is enhanced with huge 295/35 Pirelli Corsa semi-track tyres fitted at the rear while the standard 225/40 Pirelli P-Zeros are used at the front. Tony says the previous Pirellis (which were three years old) were getting fried with the turbo grunt but, still, they helped him along to a best quarter mile time of 10.92 seconds at 132 mph. We’re told that the new Corsa tyres should improve times considerably. Tony isn’t big on circuit racing but he has upgraded the brakes to 355mm drilled disc and 4-pot Brembo caliper kit from overseas. A powerful set of anchors is essential with the speed this horse can run to. And how much speed are we talking? Well, Simon has driven this twin-turbo beast off the clock - in Simon’s words, “the speedo needle was touching the horse’s arse...” And that, readers, is well beyond 320 km/h! It’s no wonder Tony has annihilated a Suzuki Hayabusa from a 100 km/h rolling start. Tony also points out that the car is deceptively fast and stable - at 280 km/h it feels like 170 km/h. Simon says the Ferrari engine is very well suited to forced induction. It doesn’t need a lot of ignition timing retard on boost (which is indicative of a very efficient combustion chamber) and no previously hidden weaknesses have been found. In fact, Simon is so happy with the final product he’s now offering a Ferrari twin-turbo kit using all the same parts as Tony’s car. Total cost for the kit is around AUD$40,000 depending on your required power output. For now, Tony is more than happy to leave the car pretty well as is. However, he does plan to retune the engine for race fuel and bump up the boost for another quarter mile attack. He’d like to fit some bigger rear tyres but, unfortunately, the rear wheel arches don’t leave much extra space. “Simon feels there’s 800hp (600kW) waiting there and it’d be nice to see if we can take it a bit faster,” says Tony. Any chance this will become the world’s first Ferrari Door Slammer? !